Silicon Valley-based Oshi Agabi has unveiled a computer based not on silicon but on mice neurons at the TEDGlobal conference in Tanzania. The system has been trained to recognise the smell of explosives and could be used to replace traditional airport security, he said. . Eventually the modem-sized device - dubbed Koniku Kore - could provide the brain for future robots. 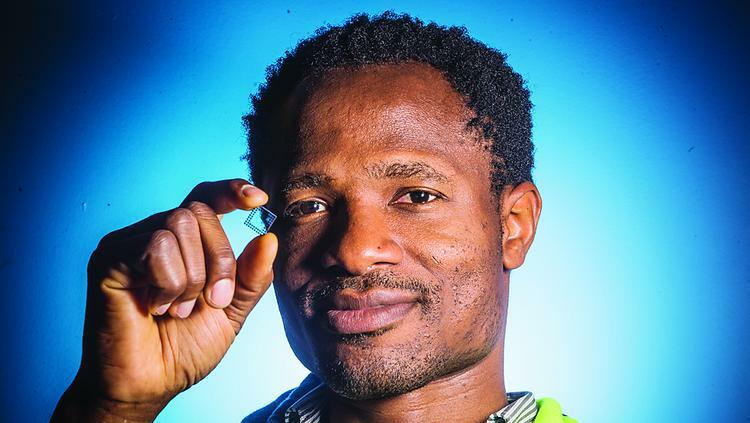 Agabi is attempting to reverse-engineer biology, which already accomplishes this function with a fraction of the power it would take a silicon-based processor. EYES OF LAGOS learnt that, He launched his start-up Koniku over a year ago, has raised $1m (£800,000) in funding and claims it is already making profits of $10m in deals with the security industry. Koniku Kore is an amalgam of living neurons and silicon, with olfactory capabilities — basically sensors that can detect and recognise smells. .
"You can give the neurons instructions about what to do - in our case we tell it to provide a receptor that can detect explosives." He envisages a future where such devices can be discreetly used at various points in airports, eliminating the need for queues to get through airport security. .
As well as being used for bomb detection, the device could be used to detect illness by sensing markers of a disease in the air molecules that a patient gives off. .
A self-described "scrawny, nerdy kid," Agabi grew up in the suburb of Surulere in Lagos, Nigeria and obtained a Bachelors degree in Physics from University of Lagos. . He went on to do further studies in physics and neuroscience in Sweden and Switzerland. "One of the things growing up in Lagos imparts in you is grit," he says. "Lagos is a place that demands grit. Growing up there gave me an unconventional way of always looking at problems." Agabi said the Koniku Kore device is “a world first” and able to do just that, essentially through breathing in and smelling the air. He said “major brands”, including those in the travel industry, had signed up and the start-up’s current revenues of $8 million (7 million euros) were expected to leap to $30 million by 2018. One of the main challenges was finding a way to keep the neurons alive, a secret Agabi did not wish to expand on, saying only they could be kept alive for two years in a lab environment and two months in the device. As AI improves in leaps and bounds, scientists are trying to make and succeeding in making machines more like our brains, able to learn and understand their surroundings: a prospect that is terrifying for many. Musk, who has repeatedly warned about the perils of AI making humans obsolete, is working on a new project to implant “neural lace” brain-interface technology to prevent humans becoming like a “house cat” to potential machine masters. However, Agabi, who grew up in Lagos where he helped his mother sell food on the streets, believes the future of AI lies in making machines more alive. He believes his company could build a cognitive humanoid system based on synthetic living neurons in the next five to seven years. “It’s not science fiction,” he told AFP. Agabi did a bachelors degree in theoretical physics in Lagos before taking an interest in neuroscience and bio-engineering for his PhD in London. He spoke at the opening session of the four-day TEDGlobal conference, putting African ideas, innovation and creativity in the spotlight with a variety of speakers who each get an 18-minute window to get across their message of choice. TED - originally known as Technology, Entertainment and Design - has built a global following for its online videos of inspiring talks devoted to “ideas worth spreading”. The annual international version is taking place in Africa for the first time in a decade with a new crop of “TED Fellows” from the continent to take to the stage.